room2learn is a Harvard Innovation Lab VIP startup that helps schools reimagine and redesign learning spaces to meet 21st century learning needs. As a UX Designer for room2learn, I collaborated with co-founders, engineers, and product managers to revamp both the product and business model through iterative cycles of prototyping and testing. I also helped room2learn craft a new vision for their website that would more clearly communicate the problem that needed to be solved and how room2learn would solve it. 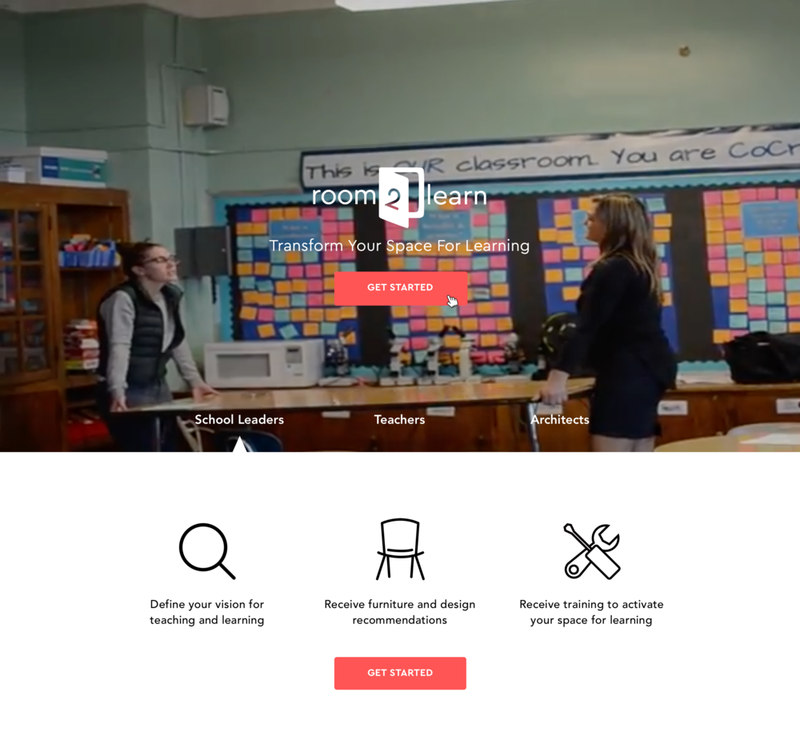 room2learn's original website served as a platform where teachers could share and browse classroom designs and hacks, similar to Pinterest. While engaging for teachers, the website wasn't useful for school and district leaders, who were our main clientele. room2learn needed to update the website to engage school leaders while scaling their business model to reach a wider audience. Our biggest challenges included working with bureaucratic school systems and helping leaders understand the impact that physical space has on learning. Step 1 - When I joined the team, one of the first things I did was to conduct an informal heuristic evaluation of the existing website. I found that the website did not clearly communicate what room2learn was, and what users could do with the platform. I also found some inconsistent and unconventional UI practices that detracted from the overall user experience. Step 2 - I sketched a vision for the new website that utilized a more linear narrative to illustrate room2learn's mission and value statement, and got feedback from my team. Step 3 - Next, I created a wireframe of the new homepage to illustrate the flow of information, with content and language to be filled in at a later stage. Next, I led our team in developing a new vision for the website through a product experience framework that explores the intersection between the meanings, emotions, and aesthetics that a product elicits for users. Then, I created a high-fidelity mockup of the homepage that included updated language and images, and gathered feedback from a focus group of teachers and school administrators. Main Takeaways: The biggest piece of feedback we received from the focus group was that, while users liked the aesthetics of the mockup, they still did not understand room2learn's value statement. In this iteration of the homepage, the room2learn team decided to use simple images to communicate their vision for how physical space impacts learning. We discovered that simple imagery was not enough. In the midst of redesigning the homepage, I also worked with the team to brainstorm ways to digitize our design consulting model. Inspired by subscription e-commerce companies like Trunk Club and Blue Apron, we decided to create a digital tool that would generate design solutions based on users' answers to a detailed survey. I built a lo-fi prototype using Google Forms, and tested it on a small group of teachers and school administrators. While users found the survey to be an interesting way to start the conversation, the biggest issue with the survey was that it relied too much on users to develop their own vision for the learning spaces they hoped to design. Again, this proved to be difficult because educators and school administrators don't necessarily know how space impacts learning. While intuitive for some, this concept is novel for others. We also found that designing a learning space was too complicated and would require a more extensive survey to be effective. However, a longer survey would result in lower completion rates. After more brainstorming sessions, we decided to experiment with an e-commerce model where school administrators could purchase furniture and designs directly. In this way, room2learn could generate revenue without relying solely on the consulting model's slow sales cycle. We decided to keep the consulting tool, but to simplify it. To recap, the first iteration falsely assumed that users already had a vision for the space they wanted to design. Therefore, for the second iteration, I created a Typeform quiz that generates a design vision based on the types of learning users want to foster in that space. Unlike the first tool, which functioned as an information collection tool, the goal of the Typeform quiz was to inspire users to imagine new possibilities for their spaces.To align the quiz with the new e-commerce platform, I also worked with the team to design an email drip campaign, which promotes the purchase of furniture from our website. We wanted to deploy a few e-commerce functions on the website right away to test their usage with current account holders. Therefore, I rapidly designed mockups for the new e-commerce functions of the website. I built a prototype of the e-commerce site and created a video to communicate the UX/UI changes with our developers. In addition to tracking views and clicks on the new e-commerce pages, we tested the new consulting tool, emails, and e-commerce pages with school administrators. In general, administrators liked how imaginative and fun the Typeform quiz was, and also liked the way we packaged design solutions in our emails. However, they wanted to be able to purchase entire rooms of furniture rather than furniture as individual pieces. In other words, they desired a way to purchase a big-picture vision for their space that was customized to their teaching and learning needs. In addition, we discovered a major flaw in the e-commerce business model: schools could not make purchasing decisions above a certain dollar amount without going through facilities managers at the district level. In Boston, this dollar amount was $5,000; any purchases above that figure would require months of vetting under strict protocols that would make direct purchases from room2learn unfeasible. Feedback on the e-commerce prototype indicated that selling to schools would be financially unsustainable, so we decided, for the time being, to shift our customer base to school districts. Our team brainstormed a way to sell districts a vision for their learning spaces, while avoiding the bureaucracy that would make purchasing through room2learn difficult. We would provide district leaders with a blueprint for their spaces that included furniture and interior design specs. Room2learn would handle the design, and districts would handle the purchasing. We decided that for an MVP we could test, we would update our consulting tool and use that as an entry point, create a mockup of the homepage to describe our new product, and develop a few low-fidelity blueprints. This version of the homepage, as you can see below, was an improvement from the original homepage because it effectively communicated room2learn's benefit to customers, while directing users to one clear call to action. I also created a style guide to accompany the mockup, as preparation for a redesign of the website. Before the MVP was complete, our team discussed concerns we had with the blueprint model, including how we would be able to distinguish ourselves from and compete with architecture firms. Our co-founders then had a conversation with an architecture firm that led to our next big pivot. We discovered that architecture firms faced a number of challenges in designing school spaces, and that room2learn could position ourselves to address these challenges. It was an aha-moment that made complete sense: rather than compete with architecture firms, we would offer our services to them as a subcontractor. We thus shifted our business from a business-to-consumer model to a business-to-business model. We began to compile notes from prior conversations we had with architecture firms, as well as schedule phone calls with other firms to better understand their pain points and needs. I developed a set of interview questions for these conversations. Our goal was to understand their current design process (jobs), their challenges (pains), and what they could gain by working with us (gains). We mapped out our interview findings via post-its, and I organized them into a user journey. We weren't ready for a complete re-haul of the website just yet, since room2learn was still in the process of defining and developing the product. However, our website needed to be updated to show that architecture firms were part of the equation. I worked on some changes to the website that incorporated our new audience members, while also fixing inconsistent UI elements. Lastly, I noticed that the website used too many different font styles, and that they weren't being used consistently. So, I created a font guide that consolidated them, and then worked with our engineers through pair programming to update the fonts on our website. room2learn was created to bridge the gap between learning and the design of physical spaces. Throughout our many pivots, a reoccurring challenge has been working with school systems that have numerous stakeholders with competing needs. We have experimented with various business models that all address the same problem, though in different ways. Through the rounds of rapid prototyping, testing, and iterating we have conducted, room2learn has collected data towards the piecing together of a complicated puzzle. Through my work with room2learn, I have explored the ways in which technology can scale solutions and engage audiences. We've drawn inspiration from brands like Trunk Club, IKEA, and Wayfair, who use digital interfaces and AI to scale and customize design solutions for customers. Other emerging tech. such as VR/AR could help school and district leaders visualize the link between space and learning in an immersive and delightful way. Last but certainly not least, technology can help room2learn make the design of physical spaces more user-centered by democratizing research and data collection processes. Photos used in the blueprint mockup are attributed to Kurani and Unsplash.